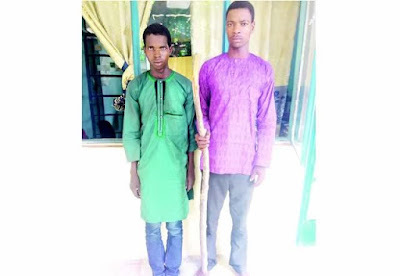 The police in Niger State have arrested two suspected robbers who attacked vehicles conveying goods from the market in Kokongi through Wawa village in the Borgu Local Government Area of the state. The suspects, Jariri Chede, 25, and Janya Shehu, 20, were arrested by police detectives attached to New Bussa Division after robbing one Sunday Ishaya of Kokongi village of his money and other valuables. It was learnt that the victim was driving to Kokongi en route Wawa village when the robbers dispossessed him of N70,000 and a Tecno phone valued at N73,000. The suspects also went away with two cartons of dry gin valued at N9,000 and a box of snuff valued at N2,000. Northern City News gathered that the suspects emerged from the bush and attacked the victim with a single-barreled gun and cutlasses with which they inflicted injuries on him, leaving him in a pool of his blood. Shehu, who got married recently, said that he joined the gang because he needed money to take care of his wife. The Police Public Relations Officer, Muhammad Abubakar, told Northern City News on Sunday that the police are still on the trail of another member of the gang, noting that the suspects would be arraigned in court after investigation.